Wow! I've been horrible at keeping the blog up to date on my knits in progress. Here's another project on my needles that I've mentioned a few times on the blog but never made "official". You'd think I was trying to keep secrets from you guys or something! Nah. I've just been lacking the time to do any proper WIP and FO photography (um, have you seen my Ravelry project page? All recent project photos are from my Instagram! So, so sad! ), and haven't had the chance as of late to sit down and write proper blog posts. At least, coherent ones. I've started posts but then get distracted with other ideas and thoughts. I've been so scatterbrained lately! Anyhoo, enough beating around the bush. This here is my first sock of the year. Yeah...remember how I said this was going to be the year of the sock? Well, it hasn't been. At least not yet. It's already the 4th month of the year and I'm just starting my first pair. Luckily I have 8 more months to catch up! For the first pair of the year I decided to take it easy on myself by going with a plain vanilla sock formula and letting fun self-striping yarn be the center of attention. I'm not following a pattern but what appears to be "my usual stripey sock recipe", which is toe-up (using Judy's Magic Cast-On), afterthought heel, 2 inches of 2x2 ribbing, and Jeny's Surprisingly Stretchy Bind-off. Seriously, the.easiest.knit.ever. Don't let the idea of afterthought heels scare or even intimidate you. It may look complicated but really, it's the easiest thing to pull over. Ever. And even easier if you knit Magic Loop (cause you already know which stitches/needle the afterthought line is going to be knit on). 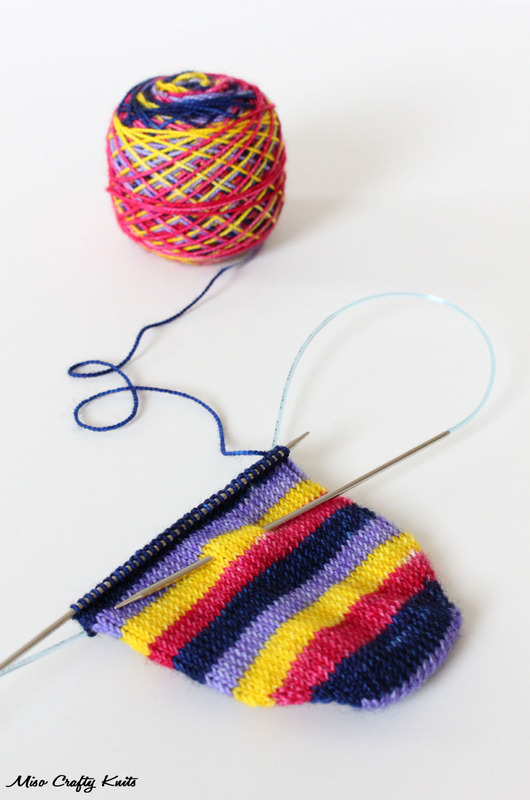 It's my go-to heel of choice when knitting with self-striping yarns. Why? Because it doesn't interfere with the stripey goodness of the yarn. All other heel methods cause uneven striping or weird pooling. To me it just looks messy. The afterthought heel makes the whole sock look put-together and eye pleasing in the consistent striping, and depending on how wide your stripes are, can even make the heels have either a nice striping or bullseye effect. Because I know you'll ask: the yarn is Knitterly Things Vesper Sock. The colourway was chosen by the Munchkin, it's quite appropriately named "April Showers...Bring May Flowers". It was a club colourway from last year. Would you believe that I have several skeins of Vesper Sock in the stash but have never knit with it before? Since I also vowed that this was going to be the year that I try out different yarn brands, why not start out with one who produces yummy self-striping colourways? So far these are knitting up pretty fast. I had cast on the first sock while at Vogue Knitting Live and have already cast on the second sock. 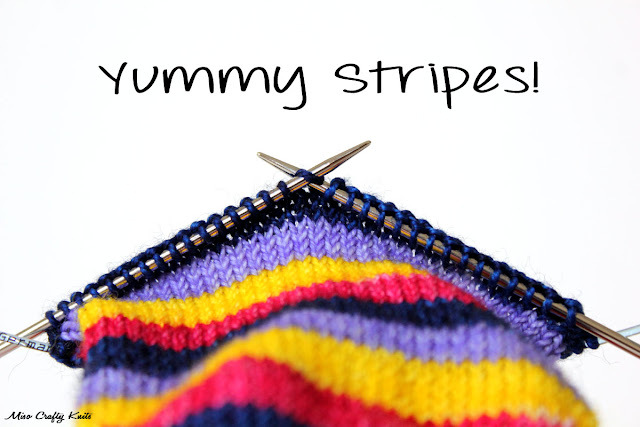 One thing about self-striping socks? They become quite addictive to knit. You keep telling yourself "just one more stripe then I'll go bathroom/do the dishes/eat food/shower so that others won't avoid me". Although, I think I bound off the first sock a bit too soon. For some weird reason I didn't have a measuring tape in my project bag (it was gnomes, I swear! ), and so I kind of guessed how tall the socks were. They're a little on the shorter side of what I like, but nothing to be concerned about. I dealt with the fact eons ago that I would never be able to use up every last inch of yarn in the ball with socks, unless I was knitting knee socks, so I still have a fair amount of yarn leftover. I just might rip out the bind off and keep knitting. We'll see. I just might be too lazy in the end to do all that work for an extra half inch of height. I forgot how fast plain vanilla socks can knit up, especially when you've got small feet (I'm a US6, UK4). It's also so easy to throw this project into my handbag as I head out the door, and so easy to whip out and work on whilst waiting around in public. Another reason why these socks are knitting up lightning fast: I've been trying out new needles. The first sock I've knit with Knitter's Pride Karbonz and the second sock I've been using (and absolutely loving!!) Addi Turbo Sock Rockets that just came out on the market a few months ago. I reckon I'll have these socks finished before the month is over. Yay! I have other stripeys in the stash that I'm extremely tempted to wind up and have at the ready when I do get this pair off the needles. I may not always have a bright and cheerful sweater on the needles, so I make sure my socks are at least!! 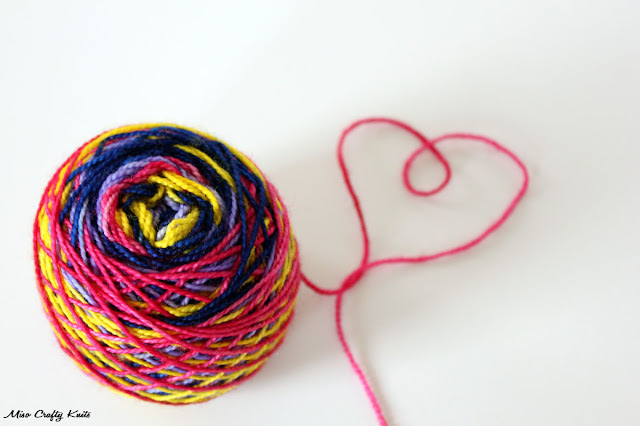 ;) if you can't go crazy with sock yarn, when can you?? 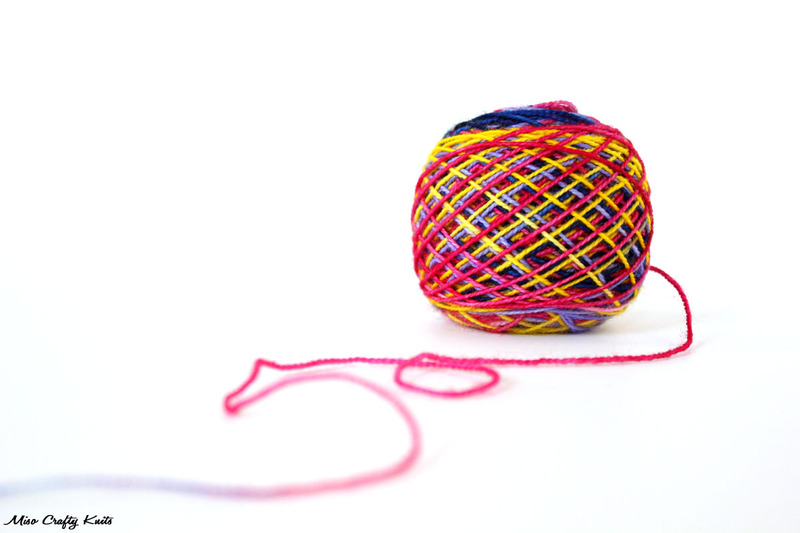 Do you knit your socks with only 3 needles? From that second photo it looks like you have half of your stitches on 1 needle (and I'm assuming another behind it for the other half). Seems like it would be a ton faster, but prone to laddering...or maybe it's just like that for the photos...do explain, please!